This area is at the base of the mound, just beyond a dark dune field. Here, orbiting instruments have detected signatures of both clay minerals and sulfate salts (see labels on image). Scientists studying Mars have several important hypotheses about how these minerals reflect changes in the Martian environment, particularly changes in the amount of water on the surface of Mars. The Mars Science Laboratory rover, Curiosity, will use its full instrument suite to study these minerals and how they formed to give us insights into those ancient Martian environments. These rocks are also a prime target in checking for organic molecules since these environments may have been habitable -- able to support microbial life. A canyon was cut in the mound through the layers containing clay minerals and sulfate salts after deposition of the layers (marked by arrow). This canyon, much like the Grand Canyon in Arizona, exposes layers of rock representing tens or hundreds of millions of years of environmental change. Curiosity may be able to investigate these layers, gaining access to a long history of environmental change on Mars. The canyon also contains sediment that was transported by the water that cut the canyon. This sediment interacted with the water, and the environment at that time may have been habitable. Thus, the rocks deposited at the mouth of the canyon form the third target in the search for organic molecules (marked by arrow). 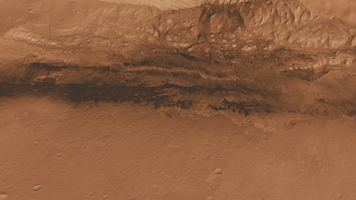 This three dimensional perspective view was created using visible-light imaging by the High Resolution Imaging Science Experiment camera on NASA's Mars Reconnaissance Orbiter and the High Resolution Stereo Camera on the European Space Agency's Mars Express orbiter. Three-dimensional information was derived by stereo analysis of image pairs. The vertical dimension is not exaggerated. Color information is derived from color imaging of portions of the scene by the High Resolution Imaging Science Experiment camera.